‘If you talk to a man in a language he understands, that goes to his head. If you talk to him in his language, that goes to his heart’ – Nelson Mandela. Languages are the most powerful instruments in preserving and developing our tangible and intangible heritage. Indira Gandhi Institute of Dental Sciences (IGIDS), Sri Balaji Vidyapeeth, Pondicherry, celebrated ‘MATRIBASHA DIWAS – INTERNATIONAL MOTHER LANGUAGE DAY’ on 21st February 2019. An array of competitions including elocution, drawing and essay writing were organized at IGIDS for both undergraduates and postgraduate students. 24 students enthusiastically participated in these competitions and exhibited their love for their mother tongue. Essay writing and drawing competitions were held on 20th February 2019. Essays were written in different languages including Mizo, Malayalam, Tamil, Telugu, Hindi, etc. The essays revealed students not only loved their mother tongue but they also had an equal amount of acceptance and respect to the other languages. Drawing by the students ranged from the traditional paintings of their state to contemporary art that included fancy slogans in praise of mother language. They were colourful, bright and unique. The Mithila painting, native painting of Bihar, was done by one of our Bihari students, was a treat to the eyes. Elocution competition was conducted on 21st February 2019. The participants exhibited much confidence and courage as they spoke in their mother tongue. Their ideas were diverse and thoughtful. Dr. Chitra, postgraduate student, Department of Oral Pathology, IGIDS, spoke about the importance of learning through mother tongue. She explained how cognitive and kinaesthetic skill of the child develops better on learning through mother tongue. 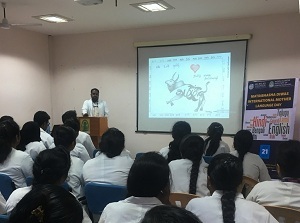 Dr. Muthukumaran, postgraduate student, Department of Oral Pathology, IGIDS, explained the rich literature of his Tamil mother tongue and how Tamil has evolved with time. Mr. Kevew, an undergraduate student, spoke in Nagamese and it was enthralling to listen to unfamiliar words. Participants also spoke in Telugu, Malayalam, Hindi and Marathi. Prof Saravana Kumar, Principal, IGIDS, addressed the gathering and distributed certificates of appreciation to all the participants.